The Earth's climate seems stable in respect to humankind's limited length of historical knowledge, but in reality, it is an ever-changing system. Climate change has been occurring since the Earth began, passing through long periods of fluctuating temperatures. Climatologists refer to the historical record, which goes back to the mid-nineteenth century, to study recent shifts in climate. This record of temperature measurements indicates that since 1860, the mean (average) annual surface temperature of the Earth has risen by about 0.5 Celsius degrees (0.9 Fahrenheit degrees). This finding supports the theory that the Earth is presently in a period of global warming. The questions important to scientists and policymakers are the extent, period, and cause of the warming. One major factor in global warming is a solar heating process termed the greenhouse effect . The glass structure of a greenhouse allows most of the Sun's light inside, but stops a good share of the heat from escaping. This causes the temperature inside the greenhouse to be warmer than the outside air. The Earth's atmosphere, along with certain greenhouse gases , acts much like a greenhouse, absorbing the infrared energy emitted by the Earth and warming the atmosphere. Without the presence of a greenhouse effect, the temperature of the Earth would be about −18°C (−0.4°F) instead of its present 15°C (59°F). The most abundant greenhouse gas is water vapor, followed closely by carbon dioxide (CO 2 ). There also are trace gases including methane (CH 4 ), nitrous oxide (N 2 O), tropospheric ozone (O 3 ), and human-made chlorofluorocarbons (CFCs). These trace compounds, though in very low concentrations, are important because they absorb far more radiation, molecule per molecule, than does carbon dioxide. The estimated percent contributions of these greenhouse gases to increased greenhouse effect based on their present concentration in parts per billion by volume (ppbv) are as follows. The carbon dioxide content of the atmosphere varies over time. Carbon dioxide is both natural and human-made, and has increased by 25 percent in the last 125 years. Human industrial activities, especially since the Industrial Revolution , have increased the CO 2 content of the atmosphere. The increase is evident in the following figure, which shows atmospheric CO 2 in parts per million (ppm) at three locations: South Pole (red circle); Siple, Antarctica (blue square); and Mauna Loa, Hawaii (green square). The burning of fossil fuels , such as oil, coal and natural gases, are sources of energy that release carbon dioxide. Carbon dioxide uptake by plants during photosynthesis, and release by animals during respiration also influences the amount of atmospheric CO 2 . There are more land plants in the Northern Hemisphere than in the Southern Hemisphere simply because there is more land north of the equator. Each year during Northern summers, plants absorb more carbon dioxide than is produced. When the growing season ends in the Northern Hemisphere, the carbon dioxide content of the atmosphere resumes the increase that results from the burning of fossil fuels. The seasonal influence of land plants is obvious in the following diagram, which shows atmospheric CO 2 in parts per million (ppm) for Mauna Loa, Hawaii. Because carbon dioxide is 30 times more soluble in water than are most common gases, the ocean contains most of the carbon dioxide in the ocean–atmosphere system. The phytoplankton living in the surface layers of the world's oceans convert CO 2 into plant tissue, and in some cases use CO 2 to build calcium carbonate (CaCO 3 ) shells. As organisms die, their remains deposit on the ocean floor, along with other debris, burying calcium carbonate and organic carbon in sea-floor sediments. The ocean therefore performs as a giant sink for carbon dioxide, absorbing the gas and removing it from the atmosphere while depositing much if it as marine sediments. The Earth seems to have had a relatively constant temperature over long periods of geologic time. It is reradiating energy back to space at a rate approximately equal to the rate it receives energy. Most of the energy the Earth receives from the Sun lies within the ultraviolet and visible light spectra. The atmosphere is transparent to most of this radiation, but the oceans and the continents absorb about half of it. Because of the high heat capacity of water, the oceans can absorb and hold much more solar energy than the air or the continents. When the oceans reradiate this stored energy back toward space, it is changed to infrared energy. The greenhouse gases in the atmosphere absorb some of this infrared radiation, which warms the atmosphere. To understand how the present-day global climate compares to past climates, scientists have had to look beyond the limited 140 years of weather data and examine the Earth's paleoclimate. Paleoclimate is a term used to describe the ancient climate long before instruments were developed. Instead of instrumental measurements of weather and climate, paleoclimatologists use natural environmental (proxy) records to estimate past climate conditions. Research methods involve analyzing sediment core samples from the ocean floor and ice cores from the polar ice packs. * Some of the things being sought are fossil plankton , plant pollen, and preserved insects that are locked in ocean sediments, and chemical and isotopic data from sediments and polar ice. By dating the samples and identifying species and abundance, researchers can reconstruct the general climate of a region during its geologic past. For example, globally averaged temperatures and the atmospheric concentration of CO 2 in parts per million (ppm) over the past 160,000 years have been estimated as follows. The paleoclimatic record not only allows scientists to examine global temperature fluctuations over the last several centuries, but it also reveals past climate change even farther back in time. This perspective is an important tool used to help understand the possible causes of the present-day global warming. In 1988, the United Nations established the Intergovernmental Panel on Climate Change (IPCC) to evaluate information on climate change. In a 2001 report, the IPCC concluded that 1) global warming will occur if greenhouse gas concentrations increase, and 2) the concentration of greenhouse gases in the atmosphere is increasing. It can thus be inferred that global warming is occurring. Each year, human activities inject 6 billion tons (6 gigatons) of CO 2 into the atmosphere. Three gigatons remain there, 1.5 gigatons go into the ocean, and the fate of the remaining 1.5 gigatons is unknown. Pre-industrial levels of carbon dioxide were about 280 parts per million by volume (ppmv), and current levels are about 370 ppmv. 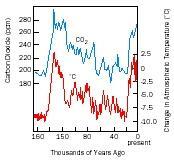 The concentration of carbon dioxide in the atmosphere today has not been exceeded in the last 420,000 years. By the end of the twenty-first century, some scientists expect to see carbon dioxide concentrations of anywhere from 490 to 1260 ppmv, which is 75 percent to 350 percent above the estimated pre-industrial concentration. The projected temperature change of 1.5°C to 4°C (3°F to 7°F) by the year 2100 would be unprecedented in comparison with the best available records from the last several thousand years. This could cause higher sea-surface temperatures, intense tropical storms, longer and more intense heat waves, and melting of ice in glaciers and ice shelves. 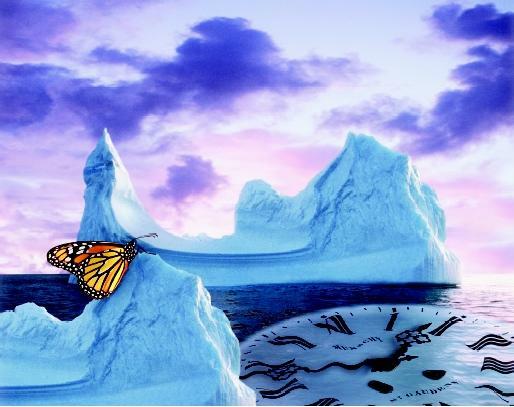 This artistic representation of global warming poses the questions "when?" and "what will happen to the world's oceans?" Melting of ice found in glaciers, ice shelves, icebergs, and sea ice is the most common expectation, but other possible effects are equally far-reaching. The butterfly represents the so-called "butterfly effect," the principle associated with mathematical chaos theory, which says that small changes in initial conditions can lead to very great ones in the final phenomena; hence, accurate prediction becomes impossible. change are undergoing continual refinement in an effort to decrease the uncertainty of these predictions. SEE ALSO Algal Blooms in the Ocean ; Carbon Dioxide in the Ocean and Atmosphere ; Climate and the Ocean ; El NiÑo and La NiÑa ; Glaciers, Ice Sheets, AND Climate Change ; Global Warming and Glaciers ; Global Warming and the Hydrologic Cycle ; Global Warming: Policy-making ; Ice at Sea ; Ice Cores and Ancient Climatic Conditions ; Ocean Biogeochemistry ; Ocean Currents ; Ocean-Floor Sediments ; Oceans, Polar ; Sea Level ; Sea Water, Physics and Chemistry Of . Climate Monitoring and Diagnostic Laboratory. National Oceanic and Atmospheric Administration. <http://www.cmdl.noaa.gov/> . * See "Ocean-Floor Sediments" for a photograph of a sediment core, and "Ice Cores and Ancient Climatic Conditions" for a photograph of an ice core. I think this is a helpful summary of the effects of global warming, but it does not touch upon how to prevent global warming as an individual. that would make this so much more helpful.